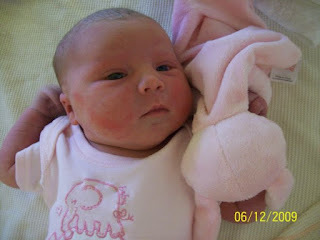 At 8am Saturday morning 5th December 2009 i phoned Labour Ward too see if they had room for me to be induced. They did, so we got to the hospital by 9am. I was so nervous! My Dad was my birthing partner. Mia's Dad wasn't around in the pregnancies or first few months. Anyway, i was put in to Room 5. A midwife came in and put me on the monitor then by 10am she broke my waters. I got told to walk round the hospital to help make my contractions come quicker/stronger. So we went for a 1/2 hour walk. We came back and was put on the monitor for 30-40 mins again. I was told to go for another walk, but it only lasted around 10-15 mins until we had to turn around back into Labour Ward haha. I eventually got put on a drip because my contractions still weren't strong enough or long enough. In the end it worked, the pain OMG! haha! I was on Gas 'n' Air & i got Diamorphine. Can't remember much after that really.